Once a political “third rail,” the effort to repeal the Hyde Amendment has gone mainstream. Lee has waited a long time. Though Hyde is only a temporary provision, Congress dutifully tacks it onto an appropriations bill every year. Lawmakers have extended the abortion coverage ban to other people dependent on public insurance, including military servicemembers, Native Americans, and federal employees. There have been a few attempts to repeal the ban over the years—Bill Clinton tried, in 1993—but in general even pro-choice politicians have preferred not to talk about Hyde. That’s changed, and rather quickly. 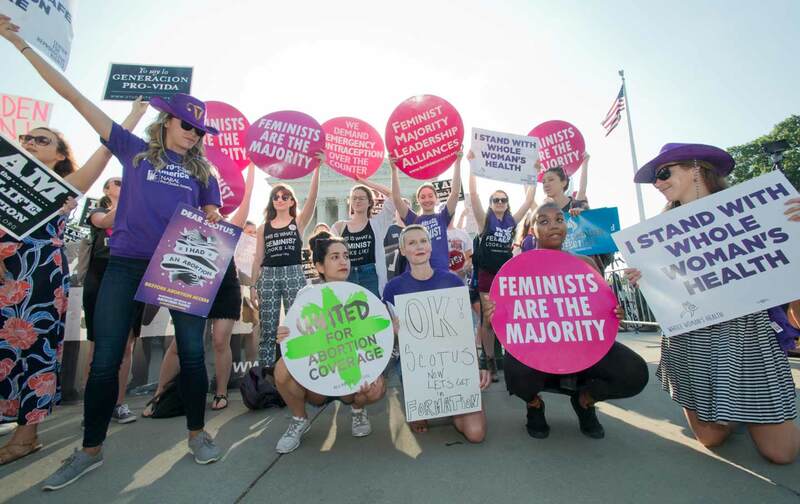 Lee, along with Representatives Jan Schakowsky and Diana DeGette, introduced a bill this time last year that would ensure that anyone with federally funded health insurance has coverage for abortion care; they now have more than 115 co-sponsors. Hillary Clinton criticized Hyde directly on the campaign trail for “making it harder for low-income women to exercise their full rights.” And, for the first time, the Democratic Party platform draft explicitly calls for repealing Hyde, as well as the Helms Amendment, which applies to foreign aid—for “full-fledged taxpayer funding of abortion,” to quote one scandalized anti-abortion writer. According to Lopez, the Hyde Amendment is “one of, if not the most, onerous barriers to abortion care.” Effectively, it puts the legal right to abortion out of reach for many women on the basis of their income—and their skin color, as women of color are more likely to rely on Medicaid than other groups. Medicare alone covers nearly one of every six American women of reproductive age, and that number has likely gone up since many states expanded their Medicaid programs under the Affordable Care Act. All together, about 20 million women rely on one of the insurance programs affected by the ban on public funding for abortion. Hyde forces some women to delay an abortion while they round up the money, which can make their procedure both more expensive and more complicated. It forces others to have children against their will: Studies in a number of states indicate that as many as 35 percent of women who want to end a pregnancy ultimately carry it to term when public funding is cut off. As many as 35% of women who want to end a pregnancy ultimately carry it to term when public funding is cut off. Yamani Hernandez is the executive director of the National Network of Abortion Funds (NNAF), which raises money to help people pay for their abortions—the procedure itself, which can cost from $300 to $2,000, as well as travel costs and other associated expenses. She says that the funds have seen a spike in requests for help in recent years due to clinic closures and other restrictive laws in states like Texas. The added barriers are particularly prohibitive for women without insurance coverage. About 116,000 people call abortion-fund help lines every year; they contemplate not paying rent, pawning furniture, or not buying as much food for their other children if they can’t get help. Hernandez says the network able to fund about 30,000 of them—less than a third. Politically, the wave of anti-abortion laws created a sense of urgency for repealing Hyde. “The anti-choice forces have just gone to far to the extreme,” Representative Lee told me. “I said, enough is enough.” Incidentally, the day before we spoke, Lee’s Republican colleagues proposed to gut the Title X family planning program that provides contraceptives for low-income adults, and $108 million for teen pregnancy prevention. “You can’t anymore be moderate with members of congress who are all the way right wing on this—trying to deny women just basic rights,” Lee said. The Pro-Choice Movement Is Finally Winning! The reproductive-rights groups began pushing members of Congress. NARAL Pro-Choice America reworked its endorsement criteria, according to president Ilyse Hogue, “to actually say that if you want to be a champion on this stuff, you’ve got to use your floor time to speak out every time the Republicans attach Hyde—move from the language of, ‘this is the law of the land’ to, like, ‘no, this is discrimination against low-income women.’” And Democrats did begin to push back, last year holding up two bills to which Republicans had attached Hyde-like provisions. Lee says all of that activism and advocacy “actually created the climate for us” to introduce the EACH Woman Act, and to incorporate the call for repeal into the party platform. Hyde “was untouchable because it both dealt with poor women and it dealt with women of color…so we had to create some political space,” says Lopez. They did so, at least in part, by lifting up those women’s stories and, as Katha Pollitt writes, by “fram[ing] abortion as a normal event in women’s lives and a basic part of health care.” It helps that political space has also grown for a discussion about economic and racial inequality, thanks to movements like Occupy Wall Street, Fight for 15, and Black Lives Matter. Now, what was once a liability actually works in advocates’ favor, allowing them to put Hyde in the context of a broader national conversation about poverty, racism, and justice—and to shift the moral compass. “The culture is ready to have a discussion about embedded race and class discrimination and our ability to access our constitutional rights,” says Hogue.